The chairman of the Joint Chiefs of Staff has told the House Armed Services Committee today that he would be open to sending a small number of US ground troops into Iraq in order to help retake the country’s second largest city, which ISIS currently holds. General Martin E. Dempsey, Obama’s top military adviser, told the House committee that, despite recent Iraqi military successes against ISIS, the door still remained open for the use of US ground troops in the country to retake Mosul. 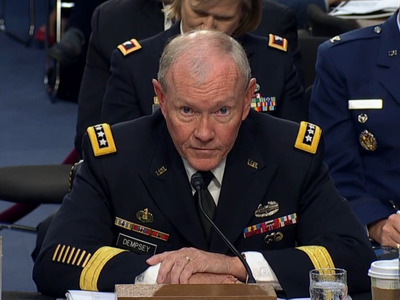 “I’m not predicting at this point that I would recommend that those forces in Mosul and along the border would need to be accompanied by US forces, but we’re certainly considering it,” Dempsey told the committee. Although Dempsey left the door open to a wider military role for the US in Iraq, he said that an American ground presence would not go beyond a “modest” force. However, Dempsey told the committee that Iraq will need approximately 80,000 effective military troops to retake all the terrain lost to ISIS. “We’re going to need about 80,000 competent Iraqi security forces to recapture territory lost, and eventually the city of Mosul, to restore the border,” Dempsey said. The US has been launching air strikes against ISIS in Iraq since August. The use of US air power helped the Kurdish Peshmerga retake the critical Mosul Dam from ISIS control. But more recently, the effectiveness of the strikes have been called into question. ISIS has continued its offensive in Anbar, effectively bringing about 80% of the province under jihadist control. The province abuts Baghdad and can provide the militant group with a vital launching pad for staging offensives against the capital. Dempsey previously told the House Armed Services Committee in September that there could be a need for greater military action against the militants once they moved into densely populated cities. President Obama is currently planning on boosting the total number of American military advisors in Iraq to 3,100. There are now about 1,400 US troops already in the country.